You start at the Gitschberg gondola lift valley station in Maranza. You travel up to 2,113 m on the mountain railway. Once arrived there, you hike to the Gitschhütte chalet (about 30 minutes). Along the way you will find various play stations for children. To those, who want to enjoy the astounding view from a panorama platform (2,510 m), we recommend Trail 12 up to the Gitschberg summit cross. The view from there is awe-inspiring! 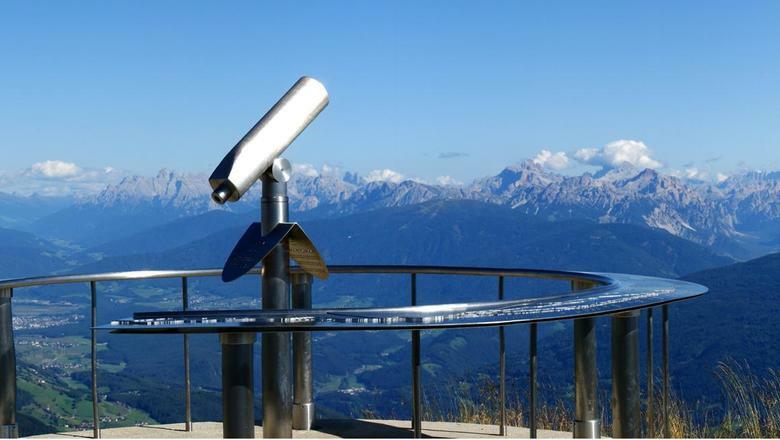 You look out at more than 500 mountain summits, a large proportion of which are summits in the Dolomites and at the snow-covered Zillertal glacier. Walking time to the Gitschütte 30 minutes. From there you can hike along a trail suitable for pushchairs. Time to the panorama platform approx. 1.5 hours.